One of the highest ski resorts in the Alps, with guaranteed skiing virtually year round, Tignes can justifiably boast a fantastic snow record that is the envy of many resorts worldwide. Tignes skiing area is part of the vast Espace Killy ski area, with over 300kms of varied terrain, linked to the neighbouring resort of Val d’Isere. Tignes is a world-famous ski resort which suits all abilities. Whilst the village charm may not be inspiring, the quality of skiing certainly is. Tignes is a fantastic option for any advanced or intermediate skiers who love to whizz around endlessly. The resort has very few queues and the snow is ever-reliable due to the high altitude. 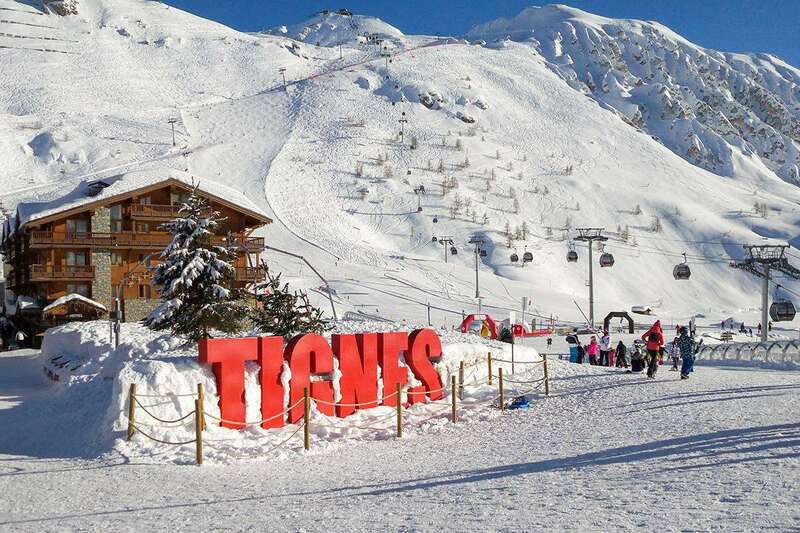 Tignes consists of 5 different areas, all of which have access to the Tignes skiing area, but will offer a different experience during a Tignes skiing holiday. Tignes le Lavachet, Tignes Le Lac and Tignes Val Claret make up the three main stations of Tignes with Les Brevieres (1550m) and Les Boisses (1800m) lower down the valley. The nightlife is great, particularly in Val Claret with lots of late night bars and a club. There are plenty of busy bars, restaurants and clubs between the three main villages to keep even the most avid night owls interested during their ski holiday. Tignes also has a modern sports centre, featuring aerobics, squash and sauna, and a nearby cinema, skating rink and bowling alley. The skiing in Tignes is simply vast, and with several free lifts for beginner skiershelping the excellent local ski and snowboard schools, (particularly Evolution 2 receiving glowing reports), progression is normally quick for first timers on a Tignes skiing holiday. There are huge long sweeping runs up on the Grand Motte glacier which should be the goal for the end of the beginner’s first week skiing in Tignes. For intermediate skiers there is a good percentage of difficult blues and reds, which are more than enough to keep even an ambitious intermediate challenged for during their Tignes skiing holiday. The trip down to Les Brevieres can be particularly enjoyable, with nice restaurants awaiting you at the bottom. Advanced skiers come back year after year to try the vast array of black pistes and endless off-piste challenges skiing in Tignes has to offer. Try Mickey’s Ears, the Fingers or the Lavachet Wall for real spine tingling vertical drops. If you crave backcountry skiing there is a spectacular tour from Tignes to Les Arcs that you cannot miss. The are many off piste areas in Tignes and plenty to keep the most experience skier happy, but less experienced skiers and snowboarders should first try Le SPOT (Skiing the Powder of Tignes) which is Tignes’ latest freesking project located at the Col de Ves lift. This is an ungroomed but patrolled area of the mountain named after a four time freeride world champion Guerlain Chichert. Skiers and snowboarders can build up their confidence here before progressing on to off piste. Conditions in Tignes are almost always exceptional. The resort has summer as well as winter skiing on its glacier area, and the high altitude of the resort (2100m) usually means a high amount of snow is on the base for the most of the winter, particularly in the higher areas. Some west-facing runs suffer from the afternoon sun; however, it is not too problematic as there are good quality snow-making machines there. Towards the back end of the season, some slopes may become a touch slushy, but this is nothing too serious. Take a look at the Tignes snow history, where you can also check the current snow report, forecast and webcams. From family ski holidays to group ski holidays, our Tignes apartments will accommodate you in any way you require. Not to mention the fantastic locations and cheap prices, they'll finish off your stay perfectly. Tignes ski chalets are the ideal way to enjoy ski holidays in Tignes and with Iglu Ski's vast selection of Tignes chalets we have something to suit everyone. If you are looking for somewhere more tranquil or luxurious, our Tignes hotels offer lots of variety. From family run traditional hotels to all-inclusive accommodations. Tignes is a great family ski destination. There are many thrilling activities to explore on and off the slopes in Tignes. The huge 300km ski area has a variety of pistes for all abilities, so there is plenty for the entire family to enjoy. One great thing about Tignes is the brilliant ski schools, so beginners and children are well catered for on a family ski holiday. There are plenty of non-ski activities in Tignes and a large range of shops, bars and restaurants to cater for all tastes. Tignes is the ultimate resort for a group ski holiday. All age ranges, abilities, skiers, snowboarders or non-skiers will love a ski holiday in Tignes. With endless runs, fantastic snow conditions, lively après and a huge choice of ski accommodation in Tignes it is a brilliant all-round resort suitable for everyone. Book early for the best choice of group chalets, early booking offers and low deposits for your ski holiday in Tignes. Après-ski in Tignes is good with plenty of options across all villages. The Loop Bar in Le Lac is a favourite option for après straight off the slopes with it's large sun terrace and regular live bands, in Le Lavachet Scotty’s Bar is a lively and popular with English skiers . Drop Zone in Tignes Val Claret has a large south facing terrace with a 3 hour happy hour perfect for an apres ski sesh. For night-time partying there are 3 clubs in Tignes: Jacks in Le Lac, and Le Melting Pot and Blue Girl in Val Claret. Other bars include: Saloon bar, Le Studio, Couloir, Grizzly’s Bar, Underground, The Marmot Arms, Jam Bar and Alpaka Lodge. With a 2 - 15 day skipass, you have free access to the Lagoon swimming centre and the ice rink (including the load of the skates) for each validity day of the ski pass (e.g. with a 6 day lift pass, you will be able to acess the pool and ice rink for all 6 days). A 6 day adult pass for the Espace Killy area costs 278 € with children and seniors reduced to 226 €. The are several free lifts in Tignes on the lower slopes for beginners so anyone new to skiing or snowboarding may not need a lift pass for the first day. Just returned from another fabulous skiing holiday in Tignes. The slopes have something for everyone - challenging off piste, snow parks to gentle greens and blues for carving and enjoying the scenery! Hotel Paquis was fabulous with excellent breakfast and evening meals - the staff were warm and welcoming. The boot room was secure, spacious and warm. Hopefully will return next year!